The quest for sustainability continues to transform the competitive landscape, forcing organizations to change the way they think. We achieve our goals by facilitating long-lasting partnerships that deliver positive impacts for partners and stakeholders. 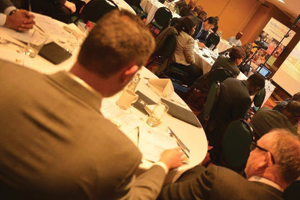 Convened every year in Canada, our Annual Stakeholders Forum provides an interactive platform to celebrate successes, discuss barriers, network and engage stakeholders. The Forum is a high-profile, red carpet event that brings together the Institute’s strategic partners, members, Board of Directors, Advisors and other stakeholders from across industry, government and academia.